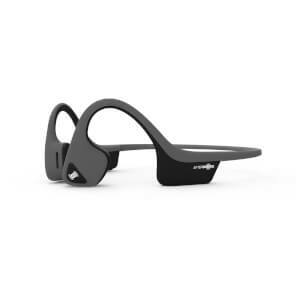 Aftershokz Trekz air The Aftershokz Trekz air arrives in a beautiful box and its premium packaging deserves the time to open carefully since it will be useful for storage in later years. The contents include a 2 year warranty card, the headphones (partially charged), a micro usb charging cable, earplugs and a carrying case which is made of rubber/plastic type material which has a very premium feel and looks waterproof. The first charge took about an hour until the LED was blue and I then connected them to two devices via the multipoint connection instructions. This worked well and now allows me to use with both phone and computer. This is a much better option than using separate headphones/earphones for both. To begin with the buttons seemed cumbersome and too fiddly but it turns out that the most important ones are the + volume button, which has a dimple to recognise by touch, and the multifunction button which is very straightforward to use. You get used to this very quickly and in the end, I think it works well. It is pretty useful to be able to also control answering the phone and pause music. The only function that’s missing is to be able to replay a song but skip forward is available with a double click. The battery remained charged for all day use and could have also been used on the second day too, but I would suggest that if it is being used all day (6 hrs) it would probably need charging overnight. In most situations I could probably use this for 3/4 days before charging. The headphones are comfortable and being made of sturdy titanium helps give them a premium feel, however they are much the same as normal earphones in that respect and I wouldn’t say they can be completely forgotten when worn. They can be worn with glasses and do seem to give the glasses some extra stability when running. The most striking feature I would say is the feeling that the sound is almost inside your head as if you’re thinking it yourself, this is a very satisfying experience and I did not notice any problems with sound quality. The sound was better than my other earphones and being able to also hear surroundings was a distinct advantage when exercising. The Aftershokz Trekz air are an expensive pair of headphones but they have a premium feel throughout and do live up to expectations I would recommend them if you find a competitive price. Probikekit UK by far provided the best competitive price for these headphones and my initial queries about what was in the box were answered in a timely and professional manner. The ordering and delivery was painless and the delivery was supplied by Hermes exactly on time as promised in the original Probikekit email. The Hermes service did provide tracking but on this occasion, there was no option for delivery to a local pickup and final delivery was in a two hour window.